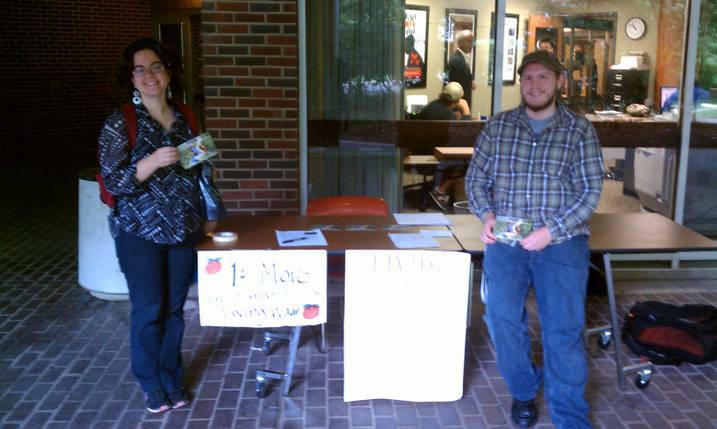 Joan Braune and Clayton Brown tabling on Thursday last week behind the UK Student Center, for the U.K. SSU and gathering signatures on postcards asking Kroger to agree to the demands of the Coalition of Immokalee Workers. Six UK students were involved with tabling for the SSU over the course of the week, and we have a great response and some great discussions throughout the week. The next UK SSU meeting will be this Thursday, Sept. 22, at 8pm at the Commonwealth Building, at 226 E. Maxwell St. (If you are used to attending our meetings, please note that this is a change from our usual meeting location.) As always, all are welcome. We had some great tabling on campus over the course of the last week and had a presence at a UK Greenthumb gathering of local groups involved in environmental justice/sustainability issues. Thanks to everyone who helped make that possible, or stopped by our table to say hi! I'm looking forward to meeting Thursday! Please spread the word to others who may be interested. *A carpool to the October 6 protest in Washington, DC. *A socialist reading group is being formed! Please feel free to contact us (standinsolidarity@yahoo.com, or the Facebook group, "U.K. Socialist Student Union") for more information or to get involved! The next meeting of the U.K. Socialist Student Union is this Thursday (Sept. 1) at 7pm at Common Grounds Coffee House (343 E. High Street, Lexington). All are welcome. Further action in solidarity with international struggles for affordable tuition? It should be a great meeting! Please spread the word and come if you can. (1) This isn't an official SSU event, but a comrade has asked us to spread the word: Louisville Jewish Voice for Peace is organizing a protest in Lexington for Tuesday, July 19, at 4pm at the TIAA-CREF office at 2365 Harrodsburg Road/South Creek Park. It is part of a national day of action sponsored by a range of organizations, calling on TIAA-CREF to divest from companies that are producing weapons and military surveillance technology for the Israeli military. All are welcome; please spread the word. For more information about the local protest, contact Russ Greenleaf at 256-525-5290 or e-mail russgreenleaf@yahoo.com. For more information about the national campaign, visit http://wedivest.org. (2) A quick update on the campaign for justice for the Florida tomato pickers: a few weeks ago, three SSUers went up to Cincinnati for a protest at the national office of Kroger, at Kroger's annual shareholders' meeting. We met with some activists from Ohio Fair Food campaign, the Cincinnati Interfaith Worker Center, and a delegate from a Florida group that's been working with the Immokalee Workers. Although Kroger is still recalcitrant, a Kroger representative did tell the activists' delegate at the shareholders meeting that Kroger knows there are customers concerned about the issue and that they are watching, keeping track of how much concern customers are showing. Let's keep the pressure on! Many thanks to the Lexington chapter of Kentuckians for the Commonwealth for getting lots of postcard signatures in support of the campaign! It's been a pleasure collaborating with KFTC and other organizations to build a multi-organization campaign for farmworker justice! On Friday, April 29, a delegation of five SSUers and friends joined over two hundred people in downtown Cincinnati, Ohio at a protest against ALEC, the American Legislative Exchange Council, a powerful right-wing think tank. ALEC has pushed anti-union laws in the Midwest, the infamous anti-immigrant S.B. 1070 in Arizona, the Voter ID act that makes it more difficult for students and others to register to vote, and a host of other horrible pieces of legislation that prioritize profit over people. ALEC has many powerful corporate members, including private prison companies that profit from draconian immigration policies. 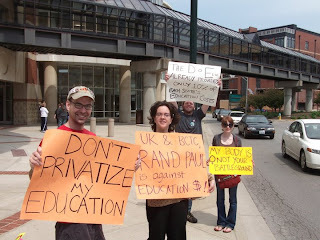 Rand Paul, our schools are not for sale! Senator Rand Paul, Tea (Party) connoisseur and apparent enemy of social services, paved roads and other nice things made possible by government funding, was in town on Monday, giving a speech at a fancy luncheon and book signing hosted by the Chamber of Commerce. Paul has been calling for an end to all federal education funding, privativization of all schools, and even the abolition of the Department of Education. This would be devastating for students, teachers, and staff, with tuition already sky-rocketing and wages/salaries declining. So we found it a bit ironic--to say the least--that the Paul event was sponsored by (amongst other organizations and corporations) the University of Kentucky and Bluegrass Community and Technical College. We didn't feel that Rand's policies represented us. We received many wonderful honks of support from passing drivers! We were also interviewed by the Lexington Herald-Leader, but they did not mention the protest in their article about the event in today's paper, which stressed Paul's plan to run to President (ahhh!). An annoyed letter-to-the-editor might be in order. From the Lexington Courthouse Plaza to Cincinnati! Our antiwar rally at the courthouse and subsequent SSU meeting last Saturday were well-attended, lively, and three people even came in all the way from Louisville! We also got some press coverage from the local ABC affiliate. It was be out on the streets as thousands were marching all over the country for an end to the wars abroad and for prioritizing human needs over the burgeoning U.S. defense budget. Coming up: Our next major effort is a carpool from Lexington to Cincinnati on Friday, April 29 to attend the big national rally against ALEC, the American Legislative Exchange Council. ALEC is a right-wing think-tank whose shenanigans recently became public thanks to a Wisconsin professor (whose private e-mails the GOP demanded to see, in retaliation). ALEC has pushed union-destroying anti-labor laws in the midwest and anti-immigrant legislation in Arizona (the famous SB 1070, which encouraged racial profiling by police and led to the movement to "Boycott Arizona"). If you're interested in joining the carpool, either hitching or offering rides, please contact me at standinsolidarity@yahoo.com, and let me know. Stay tuned for updates about our participation in a growing Kentucky movement in solidarity with the immigrant farmworkers of Immokalee, Florida (about the Immokalee Workers, visit: http://www.ciw-online.org. Rally: "Fund Our Future, Not the Wars!" "...Fund Our Future, Not the Wars!" Speakers, music, march, and (optional) die-in! Some signs provided, but bring your own if you like. All are welcome; please spread the word!